With over 270 billion messages sent and received by businesses and consumers every day, email is clearly how the world prefers to communicate. And despite how many emails people receive every day, they notice how those messages are written—especially when they come from a business. From typos to poorly organized text, just one email error can leave a bad impression and cause lasting damage. That’s why the ability to consistently craft powerful, polished emails will advance your business, career, and reputation. 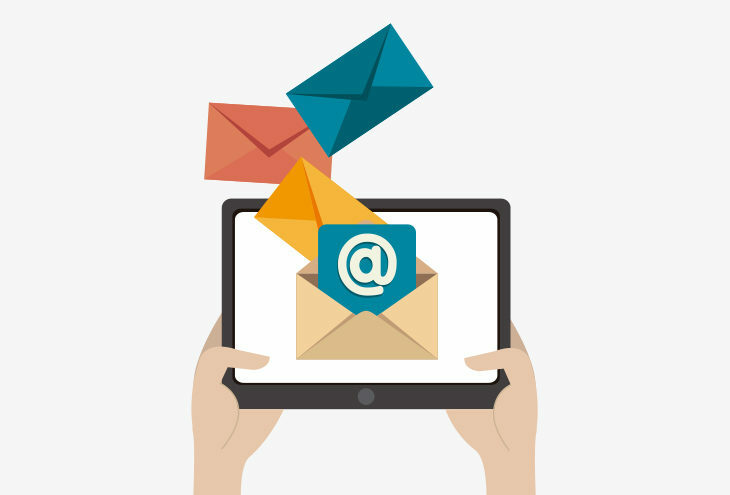 Follow these nine smart and simple strategies for bringing professional-grade power to your email communications. If you received an email from a business with a personal email address, would you take it seriously? Probably not—using personal email to send a business message can make you look unprofessional. But a custom email address in the format yourname@yourcompany.com shows customers and colleagues that you take yourself and your business seriously. In three simple steps, Office 365 helps you create professional-looking email addresses. Learn how. When emailing multiple recipients who don’t know each other, don’t use the To: or Cc: lines. They share your contacts’ addresses with strangers, and if anyone replies to all, it can annoy or even anger everyone you emailed. Avoid embarrassment and use the Bcc: line; no one will be able to reply to all or see others’ addresses. We’re used to writing from top to bottom, so our instinct is to complete an email form’s To: and Cc: lines first. Be careful. It’s easy to hit the wrong key and send before finishing. Remove the possibility of misfired emails by waiting to add contacts to the To: line until you know you’ve crafted an A+ message. Regret that email? 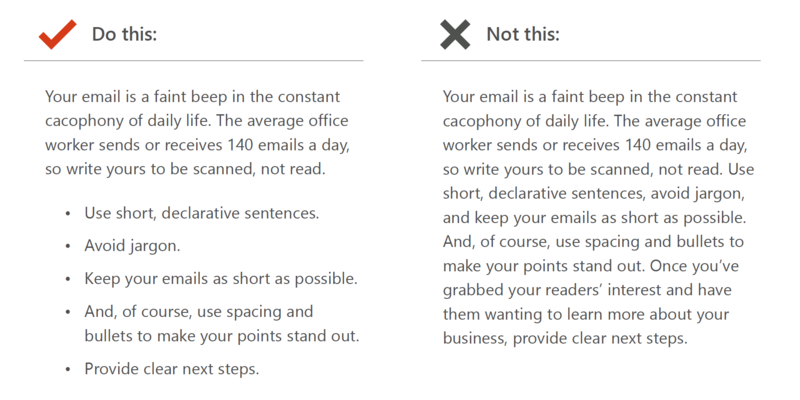 With Office 365, you can recall email before it gets read. Learn how. In many ways, the subject line is the most important element of an email. If it doesn’t give a reason to click, your email may never get read. The subject line can vary depending on your reader, but in general, keep it focused and personal, and show the value or urgency of reading. Don’t clump information into long paragraphs; readers will likely skim or skip over large chunks of text. Instead, write in succinct points—using plain language—and make them stand out with paragraph breaks and bullets so your message is easy for readers to scan and understand. Even the most captivating email message needs to tell readers what to do next. Include clear calls to action stating precise next steps, whether they be to follow a link, call a number, or reply to your email. Just make sure that what you want the reader to do is easy to understand. Learn how we can help your business at relecloud.com. To get your starter kit, call Amelia at 214-555-0101. Interested in visiting Coho Winery? Just reply to this email. attached to emails because they can carry viruses. File sharing is the solution. It allows you to upload files to the cloud and share them via links to the uploaded files. A signature is a subtle yet potent opportunity to build your brand with every email you or your employees send. It can include not just a lot of info, but also some visual interest in the form of a company logo. In Office 365, you can add a signature with a logo in four simple steps. Learn how. And don’t just proofread for spelling and grammar mistakes. Always double-check that your tone is appropriate for the subject matter. Be careful of jokes and sarcasm; when no one can see your face, your humor can be mistaken for something else. Finally, ensure you haven’t made the common error of referring to an attachment and not including one. Office 365 pro tip: You can set up an Outlook alert that will notify you if it looks like you are trying to send an attachment but forget to include one. Following these tips is just the first step in improving your professional email style. Are you ready to make the switch from personal to business-class email? Learn how you can get more out of your email performance with the ease of use, enhanced security features, and cloud based collaboration tools of Office 365. 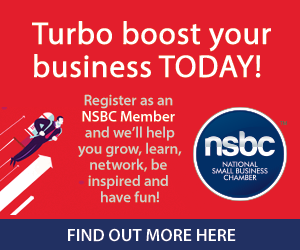 Microsoft is a proud Partner of the NSBC.